Boating Writers International has partnered with the National Marine Manufacturers Association and National Marine Electronics Association to provide judges for their respective Innovative Awards programs. Volunteer members of BWI including editors, staff writers and freelancers bring to the judging process a thorough working knowledge of boats and boating products as well as general marine industry expertise. Awards are presented in various categories at the International Boat Builders’ Exposition & Conference and the Miami International Boat Show. BWI judges are volunteers donating their time and knowledge and work within a set of guidelines developed by the NMMA. Beginning in 2009, BWI members were also asked by The National Marine Electronics Association to judge its New Product Technology Award at the annual NMEA convention. The purpose of the new award is to recognize recently introduced products and single out the “best” based on a combination of innovative design, benefits to boaters, practicality, and value. Judging participation provides opportunities for BWI members to review what’s new in the world of boating and electronic products, defer some expenses in getting to the venues where the products are featured, interact with leading marine company personnel working on innovative developments, and recognize achievement in innovation which benefits the boating public. BWI President Zuzana Prochazka is the New Product Committee Award chairperson who coordinates member involvement with the various judging routines. Members with expertise and an interest in becoming involved should contact her to gain consideration in being added to the judges list. Prochazka’s email is totemgroup@msn.com. Manufacturers and suppliers who bring to market new and innovative products to advance the boating industry are encouraged to participate in the awards process. http://www.nmea.org/Assets/nmea2009%20awards.pdf. For more information contact: David Hayden, NMEA President & Executive Director, 410/975-9425, dhayden@nmea.org. Boating Writers International has partnered with the National Marine Manufacturers Association to provide judges for NMMA’s Innovation Awards program. Volunteer members of BWI including editors, staff writers and freelancers bring to the judging process a thorough working knowledge of boats and boating products as well as general marine industry expertise. Awards are presented in various categories at the International Boat Builders’ Exposition & Conference, Minneapolis Boat Show and the Miami International Boat Show. BWI judges are volunteers donating their time and knowledge and work within a set of guidelines developed by the NMMA. 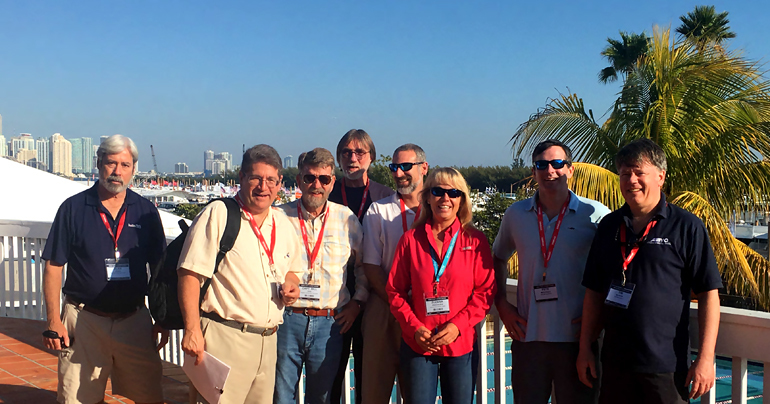 BWI members are also asked by The National Marine Electronics Association to judge its New Product Technology Award at the annual NMEA convention. The purpose of the new award is to recognize recently introduced products and single out the “best” based on a combination of innovative design, benefits to boaters, practicality, and value. Judging participation provides opportunities for BWI members to review what’s new in the world of boating and electronic products, defer some expenses in getting to the venues where the products are featured, interact with engaged marine company personnel working on innovative developments, and recognize achievement in innovation which benefits the boating industry and public. BWI Director Zuzana Prochazka is the New Product Committee Award chairperson who coordinates member involvement with the various judging routines. Members with expertise and an interest in becoming involved should contact her to gain consideration in being added to the judges list. Prochazka’s email is totemgroup@msn.com.